Cafe regulars know that flahute and I are longtime, loyal Freddy Maertens superfans. Here's another reason why (as if we needed it). A new Vedett beer ad campaign-promotion in Belgium features cafe favorite wieleridol Freddy Maertens. The concept? Have Freddy travel around Belgium in what looks like a cement mixer converted into a 'mobile bed and breakfast'. Intercept unsuspecting passers by. Talk them into a stay, with the former champion coming along as personal tourguide and party starter. Great tongue in cheek stuff. Here at the wielercafe, there's one thing we revere above all else, and that's a great champion who doesn't take himself too seriously. Can you picture any other ex-World Professional Road Champion doing this? Didn't think so. Check out the video below. I especially liked the part where Freddy reads excerpts from his new book'A life in black in white' to two English tourists who don't have a clue who he is. On this blog, with my bias, could there be any other candidate today? I called this one jongens. My money’s on King Phillip of Wallonia: Gilbert. He flies away, up Cauberg last time up. And a grateful Rhis buys him a vineyard. Remember Saronni at Goodwood? It’ll be like that. Hey, what can you say about Gilbert? That final attack was one of the best, most devastating seen at a world's finish in a long, long time. It was of course reminiscent of Beppe Saronni's 'fucillata of Goodwood' back in 1982, where he put what seemed like a light year into LeMond and Kelly in the final 250 meters. The day the UCI jumped the shark. Jumping the Shark: The moment in evolution when a show, brand, design, or creative effort uses some type of "gimmick" in a desperate attempt to keep viewers' interest -- moving beyond the essential qualities that initially defined its success, beyond relevance or recovery. This just in: cafesupporters: Qatar awarded 2016 UCI Road World Championships. Do we the fans, the faithful two wheeled masses, the peasants of this feudal culture need anymore proof that in the sport of world cycling these days, cash rules - and sporting and cycling-culture considerations are now, officially 'way-way-waaaaay off the back' of the consideration set? Who's more cash rich than Qatar? Nobody. The world's richest country according to Forbes. 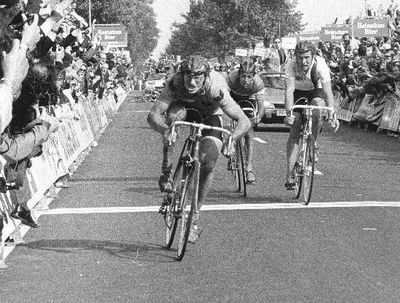 Retro: The '79 Worlds in Valkenburg - Raas is de baas. Valkenburg. Great spot for the worlds. Wish I were over there this week. I remember the 1979 world's at the same Dutch venue. It was - yikes- 33 years ago. I was just 18 then, and remember reading about how the break came into the finish and an orange clad Zeeland puncher named Jan Raas, duking it out with Didi Thurau, switched hard right across the road in the sprint and took down the Italian hope Giovanni Battaglin. Raas punched the air in triumph. German wonderboy Thurau was 2nd. France's Jean Rene Bernadeau 3rd. I guess I remember that race with more than a hint of nostalgia because that edition of VeloNews came the same week I had bought the exact same Raleigh team Reynolds 753 team issue frame that Raas rode to his worlds win. Cost to me back then? $380. Loved that frame. 'Wicked nice' ride with the flandria granfondistas Saturday. We waited for the early morning rain to blow out, deftly escaped yard work duty, and headed for a rendezvous at 10am at Chez Nick in Wrentham. Heading north boys. Destination? The closest thing that passes for a wielercafe in that locale. On the way, Nick, Dr. Brad, Marc and I met up with two cafesupporters - Steve and Jason - just after we'd climbed a nice hilll in Dover that wound up past some horse farms and other real estate properties that, although way out of my price range, were very nice to look at. Then it was a quick loop up and around Wellesley college campus, and 2 hours down, a break at one of our favorite cafe stops: The Charles River Coffee House in South Natick. 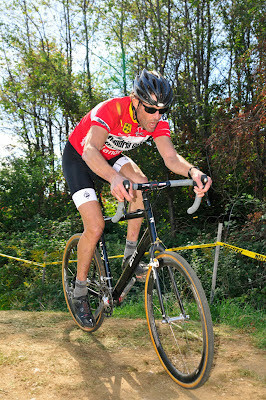 Photo of the day: Cross season is here! The weather this weekend was still summer like, but hey, don't let the warm sun fake delude you jongens.. cross season is on! Here's a few great shots of Flandria Cafe's masters veld-meister Marc Tatar taken at the weekend action at the Green Mountain Verge NECXS cyclocross up in Williston, Vermont. Despite a heavy professional work schedule, Marc somehow found time summon his inner flahute and nail a top 10 place in a highly competitive New England masters field. Can't wait for the Providence Cross festival coming up in a few weeks. Time to start the intervals. The definition of courage, revisited. Courage (noun \ˈkər-ij, ˈkə-rij\): Also referred to as bravery, boldness, fearlessness, mettle, fortitude, or intrepidity - is the ability to confront fear, pain, danger, uncertainty or intimidation. "Physical courage" is courage in the face of physical pain, hardship, death, or threat of death, while "moral courage" is the ability to act rightly in the face of popular opposition, shame, scandal or discouragement. 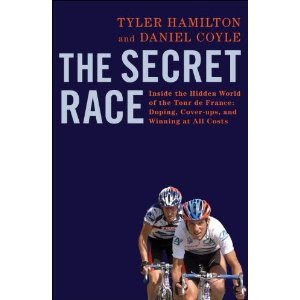 It seems to me from reading the buzzing social media-sphere over the past few days that some of you question Tyler Hamilton's moral character and motivation in writing The Secret Race. I completely understand why you feel the way you do. Don't agree, but understand. 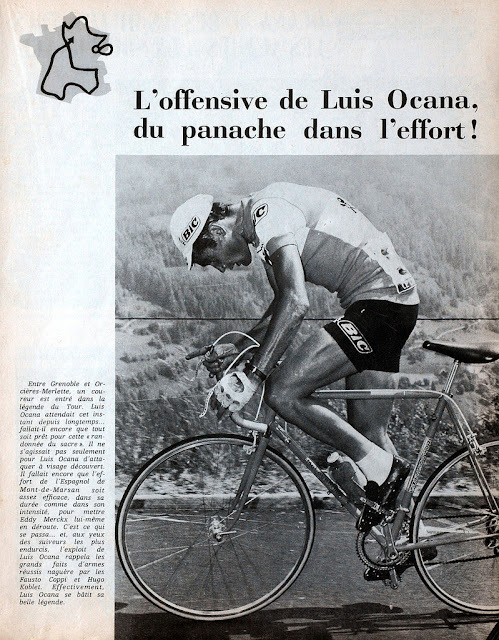 Alberto Contador reminds me more than a little a bit of Luis Ocana. It's more than the obvious, their shared Spanish looks, hair and complexion. Both wear a face of slightly tortured-soul seriousness. They both seem like a man on a mission - suffering for a higher calling. Both have a bit of an air of martyrdom about them. Both are reed thin, stringy super climbers, with silky rouleur style. Both could time trial with the best. Both unafraid to have a go at the ogre-giant of their respective generations, the Boss who made most of the riders cower. Both rode on emotion, in the moment. They'd attack again and again, with a style more energetic than smooth or powerful, dancing out of the saddle for seemingly infinite periods. And both share a knack for the dramatic - man, could they pull off an exploit. Yesterday it was the Pinto stringbean. Soloing to what looks like, barring some disaster, will be another Vuelta d'Espana victory.